Seven-foot-3 center Kristaps Porzingis joins the 2019 Mavericks. While most of America suffered through a boring Super Bowl LIII and with all due respect to the dynasty that is the New England Patriots and their defense that kept the Los Angeles Rams at bay, the sports world did not come to a halt. In fact, there were a few notable events that took place in the sports world locally. The Dallas Stars came out hot after the All-Star break. As the second part of the season is underway, the Stars look like they are finally playing as a team. Goalie Ben Bishop is on a roll. Their defense is fast, and their penalty killing is improving. The trade deadline is close and they may seek much needed offensive support. For now, there is optimism at American Airlines Center. The Stars face a lengthy road trip that may make or break the season, given that they have not played well away from home. But they seem to be starting to play up to their expectations. Mavericks make a move for the future. 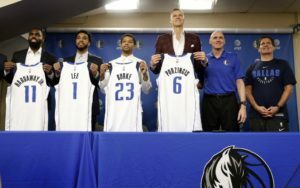 The biggest area news was consummated on Jan. 31 and later confirmed after physicals that the Dallas Mavericks were serious about the long term of the franchise. The Mavericks received 7-foot-3 center Kristaps Porzingis, guards Tim Hardaway Jr., Trey Burke and Courtney Lee from the New York Knicks for the troubled guard Dennis Smith Jr. and the soon to be free agents centers DeAndre Jordan and guard Wesley Matthews. The Knicks also receive two future first round draft picks from the Mavs, but it should be noted that all four players Dallas received were first round selections. What has created the buzz locally is the prospect of Porzingis teaming with Mavericks rookie and budding superstar Luka Dončić, learning from a great coach in Rick Carlisle and supported by a solid group of other players. The Mavericks appear to be back in the playoff game. Two things must happen. Porzingis, coming off of a knee injury, needs to get healthy. And he must sign a long-term contract extension. By the gleam in owner Mark Cuban’s eye at the introductory press conference on Feb. 4, that seems like a foregone conclusion. He will just have to refrain from buying a $250 million yacht like Dallas Cowboys owner Jerry Jones recently purchased. A long time coming. On Feb. 2, the class or the 2019 Pro Football Hall of Fame was announced. Safety Ed Reed, cornerback Champ Bailey and tight end Tony Gonzalez made the Hall in their first year of eligibility. Eight-time Pro Bowl center Kevin Mawae, cornerback Ty Law, safety Johnny Robinson and cornerback Champ Bailey also made the Hall of Fame. But of local significance, Cowboys legendary vice president of player personnel Gil Brandt made the Hall of Fame and one can only wonder what took so long. For nearly 30 years, Brandt was a key part of the Cowboys front office and a notorious talent evaluator. He has been a brand ambassador for the NFL for decades. Brandt will be 86 when inducted into Canton on Saturday, Aug. 3. More of the same in “The 817.” The Texas Rangers announced on Feb. 1 that they signed free agent right-handed pitcher Jason Hammel to a minor league contract with an invitation to major league spring training camp. Hammel, 36 years old, has spent the past two seasons with the Kansas City Royals, going 4-14 with a 6.02 ERA in 39 games. Once a starter, he finished in the Royals bullpen. Overall, this will be Hammel’s seventh team. He has a career 96-114 record with a 4.62 ERA over 377 games, and has pitched in the major leagues for the Tampa Bay (then Devil) Rays, Colorado Rockies, Baltimore Orioles, Chicago Cubs, Oakland Athletics and Kansas City. Trust me; he has nothing left in the tank. In baseball, you can’t make this stuff up. Statistics don’t lie. To the Rangers credit, they are taking far less of a chance by signing right-handed relief pitcher Shawn Kelley to a one-year, $2.75 million contract with a club option. That means the Rangers will have 63 players on the club’s spring training roster including 23 non-roster invitees. They will be looking for a player to become a local star, rising star or recognized legend. In reality, the Rangers probably had more people watching Super Bowl LIII at Texas Live! on Feb. 3 than they will at some home games this season.